Over the weekend I did the impossible. I fixed a printer. Father John of New Divine Mercy Church had a printer that got into a jam. Literally. In fact, HP Printers have a nasty habit of doing that. If you have an HP Printer be exceedingly careful with clearing a paper jam because even the slightest misalignment can kill the device for you. We don't know if John's printer was broke because of that, but the flimsy thing was in a permanent jam state and refused to even go past that into "Limp Along Mode". In fact many of these devices ended up in the dump because these instructions do not necessarily work. After cleaning everything with rubbing alcohol, I gave up and let it sit on the coffee table. Giving myself a week to cool down, I attacked it again. I got the canned air and sprayed everything liberally to blow out the dust and give myself a nasty headache. Then I got some dental floss and threaded it in the back of the cartridge mechanism behind the famous metal strip and flossed it clean. Finally I managed to rethread the metal strip under the guide that is hidden impossible to see behind the printer. Through a comedy of errors, around 5 hours of trial and error, and leaving cleaning solution on my coffee table in error, I managed to breathe life into the printer. Yes, Frankenstein, the printer is alive. Heroic efforts on my part saved the thing. At that point, for the first time in years, I was the happy owner of a Scanner/Printer/Fax Machine. It now sits on my network and I can do all of the above via the network software. So what to do with the thing. After all, it's nice to have something come back to life after it was consigned to the trash bin, make it work. I had a few pictures that I had liked from the family when I was a wee brat. The one up at the top of the article is the one I started with. 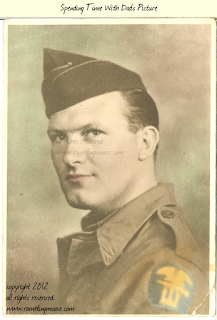 Dad circa 1940s, back when he was a Sergeant or a Master Sergeant in the US Army. I don't have all the details, and dad's been gone since 1976, so I won't have them all, but I liked the picture and it has moved with me. So what to do with it? After all I can lose the picture if the house gets destroyed. I did what I called an Archival Scan. You see that printer will spit out 600 tiny drops of ink per inch. I thought since that was good, I wanted photographic quality so the original scan was 2400 dots per inch. An hour and a half to do the first scan. The picture is reduced for the web, but the original could be printed out in high fidelity or retouched. I'll probably do that some day I have an afternoon to kill, but for now, I've got it here in 29.1 megs of JPEG beauty. I'm sure it doesn't mean much to most readers, but for my sister and some of the family, they'll enjoy seeing him up there with my copyright written across his nose. If they want an original, or a reduced scan, I'll send that along. For now, I'm enjoying being able to do that sort of thing for the first time in a very long time. There you go, Pat! Enjoy!